with human bones associated with ancestor worship. be picked clean by birds and other animals. later placed inside the burial mounds, Wickstead explained. communities well into the Bronze Age (roughly 2000 to 700 B.C. in Britain). enclosure being about 190 feet (57 meters) wide. 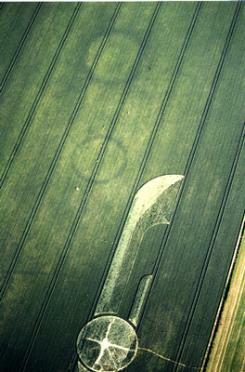 Woodhenge, a timber-circle temple at the Stonehenge World Heritage site. postholes dated to the Bronze Age, project leader Wickstead said. be the end of the regions' prehistoric period. according to Pollard, of the University of Bristol. 18th and 19th centuries targeted Bronze Age burials for their ornate grave goods. going to survive," Pollard added. chambers with burial deposits," he said. and assumedly pristine, at least underground—project leader Wickstead said. "Perhaps people in Hampshire thought [the monuments] were someone else's problem." are congregating and constructing ceremonial monuments." Kingdom, the long barrows are also the oldest elements of the complex. excavated. 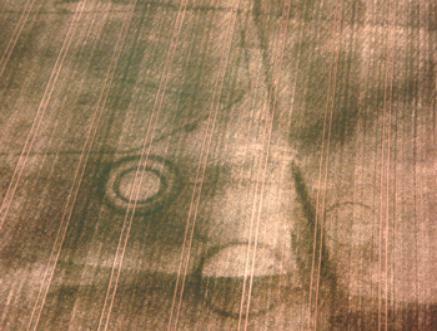 Fields on this farm also have had crop circles of the swirled kind. 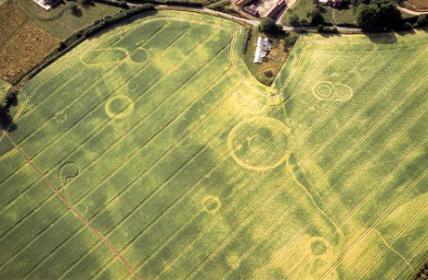 same field below Silbury Hill, Wiltshire, England. This photograph was taken during 1999.
very close. Copyright: Colin Andrews, 1999. 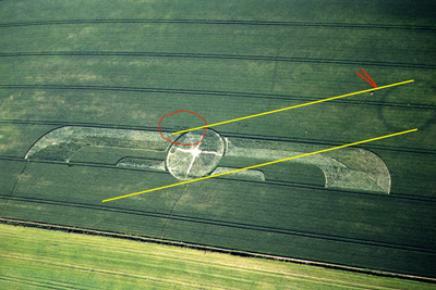 This site below has a similar appearance to the Damerham discovery nearby.